Look what was in the mailbox for me this week! My Australian and Malaysian blogging buddies felt sorry for me after my Chocolate Malted Whopper Drops post where I longingly write about Milo and the Milo bar so they sent me some treats. Suzie from Munch + Nibble in Australia sent a box full of Australian treats! I didn't get a chance to try Tim Tams when I was in Australia and boy did I miss out. They are "Made in Australia. Exporting to the world." I think they're a runner-up to the Milo bar, which Suzie sent me as well. Wow, what a taste memory. Although they've changed the bar a bit since I had it last, it was still delicious and I savored every bite. I shared one bite with the SO, but not with the kids! And the Caramello Koala treats are amazing! Joanna from Family First in Malaysia sent some Milo treats I've never heard of before: little chocolates, wafer bars, and 3-in1 Oats. Joanna also sent some Malaysian treats including a Cameronian tea, Konnyku jelly powder, local fennel powder, and some packages to help make supper making quick and easy like Perencah Berlada Hitam, Perencah Nasi Briyani, and Fish Curry Powder. I can't wait to try all these treats. I've shared some of the chocolates with the family, but I'm not sure how much more sharing I can do!! Suzie and Joanna will be happy to know I got some Canadian treats in the mail for them this week. I hope they get their packages before Christmas! Isn't food blogging amazing? Thanks so much Suzie and Joanna — you made my week! Isn't it fun to have foodie friends from all over the world? Thank you for visiting my site; your pumpkin pie looks so good! 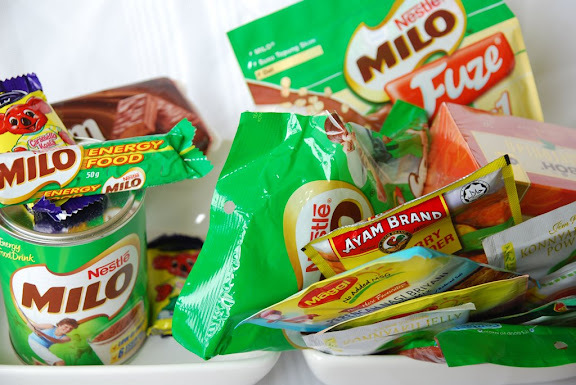 Well, when you run out let me know, for some reason we have tons of Milo stuff here! Yes, blogging is fun! I just spent an afternoon baking with a fello Daring Baker who lives in the same town! How nice of them! It's interesting how certain candies and flavours are popular in some countries but not others. I use Milo all the time in Peru. Fun to see it in different forms in your care packages! I want some Milo treats! I've never heard of that brand. Glad you liked it. And oh so exciting ... I have a christmas gift on the way! Yippee! fit chick - It's an amazing community! tartelette - I'm always amazed at the food blogging community! I'll let you know when I run out of Milo stuff here! Thanks!! dana mccauley - I found it hard to know what to send them that would be Canadian and hard for them to get. I ended up sending some maple syrup, of course, plus some other goodies. y - I'm a huge fan! And very picky (like my kids, I guess!). gretchen noelle - I've enjoyed tasting all its myriad forms! lael - So Washington doesn't have Vegemite or Milo but BC did? That's interesting. I can get Vegemite in Ottawa and one type of Milo. emiline - You'll have to try it. It's delicious! steamykitchen - It is one of the best parts of blogging! Foodie friends are the BEST! I have "met" so many lovely people through blogging! This was a wonderfully yummy package you got! Thanks for stopping by and wishing me a happy 100th post! So glad you enjoyed the treats - and don't hesitate to let me know when supplies get low or your sweet tooth gets the better of you! Thanks in advance for your package too - I am beyond thrilled by the fun of blogging friends in other countries.